The POW/MIA flag was designed in 1971 by Newton Heisley, the creative director of an advertising firm and a former World War II air forces pilot. He was commissioned by a member of the National League of Families of American Prisoners and Missing in Southeast Asia, the wife of a missing soldier who felt strongly about the importance of a symbol for the organization. This double sided flag depicts a black on white silhouette of a serviceperson bowing down his head in distress. In the background is a guard in a watchtower and barbed wire signifying imprisonment. This powerful image reminds us of all of the American soldiers who are still unaccounted for or prisoners. The words "You Are Not Forgotten" were inspired by the designer's personal fears of being held captive and forgotten during war. On National POW/MIA Recognition Day in 1988 the flag was first flown over the White House. 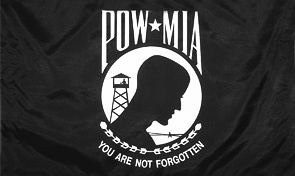 National POW/MIA Recognition Day is observed on the third Friday of September.